Carey, Peter. The Fat Man in History and Other Stories. New York: Random House, 1980. The stories in this collection are linked as part of a near-future, after an unspecified revolution in which the social and political world has changed. While most can be said to be speculative fiction, two stories in particular are definitely science fiction: “The Chance” and “Exotic Pleasures”. 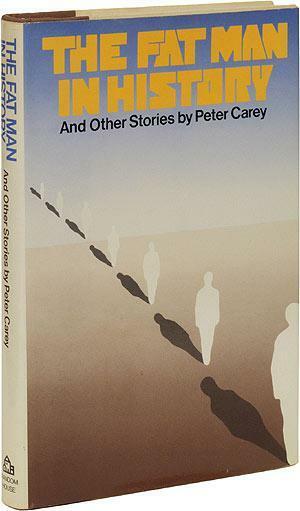 The Fat Man’s inside jacket compares Carey with the painter René Magritte, whose surrealist paintings challenged the observer perception of the normal. It’s an apt comparison as far as it goes, but I think there is a better one. If Carey resembles Magritte in the image of his world, he reminds me inescapably of John Wyndham in his peopling of it. It’s always difficult to assess a collection of anything as opposed to a single unit, but in its sparsely defined environment The Fat Man does have an overriding style which links the stories together. (It is likely what suggested the link with Magritte to the publishers.) This narrative choice is the focus on character relationships as a macrocosm of the wider environment, as opposed to relationships as an addition to it. I say “macrocosm” as it is, I think, more accurate to describe the wider events as reflections of the characters than it is to describe those characters as reflections of the new social and environmental landscape. And because the focus on character is so close, so glaring, the outer world has fallen a little out of focus. Paul and Carla are not lumped in to give a romantic interest to a storyline focusing on the possibility of genetic change – they are the result of that possibility being an accepted part of society. Lilly and Mort are not scientists dealing with the threat of environmental devastation, the result of lax quarantine laws in the age of space travel – they could not really care any less, and the real damage of the story is the damage to their relationship and not the planet’s ecology. In many ways Carey has an approach to story that is very much reminiscent of Wyndham, he who was famously described by Brian Aldiss as being the purveyor of the “cosy catastrophe”. In Carey’s own cosy catastrophes, his own domestic dramas, the setting of the new world of the future is illustrated in brief brushstrokes on the edge of the canvas. In “The Fat Man in History” Alexander Finch may internally rail against the new political order, he and his fellow housemates may fantasise about exploding down the 16 October Statue, but on his own Finch is at best capable of stealing a pair of double blue sheets, blue because “it is cooler than white, and because it doesn’t show the dirt so badly” (14). His goals and perspective have become so limited that he is reduced to a sort of grubby domesticity, a dream of consumption that becomes reality in the only environment in which Finch has any influence left. The soldier guarding a line in the desert in “A Windmill in the West” has become so detached from political reality, so confused in his own hot brain (not so very different from the lonely baking caravan he is housed in) that he know longer knows which side of the line is “his” side, and which belongs to the Australians. And when people and things begin to dematerialise in “Do You Love Me?,” that question, and the frequency of the answer “No”, is the force that pushes people apart, not the disappearances themselves. It’s a clever tactic, in that the confusion and displacement of the characters is reflected in the reader – no setting is ever fully delineated, and the environment is continually almost recognisable. Like the characters, we realise that however pretty it looks, something is off. Like Lilly’s smuggled bird in “Exotic Pleasures”, the apparently harmless is intrinsically harmful – especially to the characters. Having set a scene of unease, Carey – like Wyndham – creates a cast of domesticated, highly relatable people struggling with normal problems. They are not heroes; certainly not the heroes that are the staple of the science fiction genre. These are the people the heroes leave behind, the dreary banality of people who desire to be other than they are and who are mortally afraid of their capacity both to change and to be stagnant. Lilly and Mort, a young and loving couple progressively driven apart by redundancy and the intrusion of the alien, are painfully recognisable in their development. They begin the story almost penniless, jobless in a nation of desperate unemployment. The strain wears on them both, for Lilly is pregnant and Mort cannot find work. Yet when Lilly impulsively buys a strange extraterrestrial bird, one that gives pleasure and encourages addiction to its presence, the focus of the story does not change (except in fragments) to a wider view, but remains tightened on a relationship that is under progressively more and more strain. The catastrophe is not averted by their ability to make a living, but is underlined by the new roles in their relationship. As a mix of speculative and science fiction, there are two things that really made this collection stand out for me. The first is what I consider to be the purity of its approach to genre. I have always considered the best of science fiction to be that which introduces a new element into society, and explores the consequences on ordinary people. Science fiction as such is a democratic genre, the genre of the people, unlike fantasy literature which so often focuses on the epic and the elite – although that tendency has spread into science fiction far too often for my liking. The Fat Man brings the camera in close again, to the quiet desperation of ordinary people in a world they are never expected to understand, a world in which they lack the capacity to operate effectively. The secondary strength is in the women of the piece. Again, Carey is similar to Wyndham here – both produce female characters that feel far more real to me than is the norm in the genre, where the tendency remains to either “fantasise” women, to turn them into the Other, or to produce a plasticine heroine. (It’s no coincidence that the books reviewed in this blog have women I can relate to rather than women I roll my eyes at.) Carey’s women are as intensely drawn as the men – as paranoid and as pitiful and as rich. Carla’s delusion that their relationship could continue after her Chance is painfully inaccurate, and Paul’s attempts to stop her are fruitless. After her change she comes to him in the middle of the night, waits by his sleeping bed. Paul likes to think to himself that “I am better than that. It was the wrong time. Undrugged, ungrogged, I would have done better” (86) but he knows that he is lying to himself, and pretends not to wake, pretends not to see her new self. Carla is not fooled. There’s no happy ending in these stories, but no particularly sad ending either. There is just an ending, perhaps dimly melancholic but that is all. And amongst the common people, perhaps that is all one can reasonably expect. There are no heroes here, after all, and no anti-heroes either. They do not achieve miracles, do not define themselves more clearly against the suffocating pressure of a wider picture. That remains as blurred, as slightly surrealist, as it began. Wow, I’ve never heard of this guy — did some research, he’s one of Australia’s most famous writers, won the Booker prize, etc… i.e. a very literary figure who dabbled in sci-fi. I should find this collection…..